When we talk about the beautification of the patio, this means some real business. Because the patio is one of the most important portions of your residence. With just some innovation and creativity you can turn it into a perfect sitting place. Despite a large number of pallet wood ideas especially for patio, we still hear people demanding for more of the patio ideas because they never seem to be contented with them. Here are some smart patio ideas for pallet recycling projects. 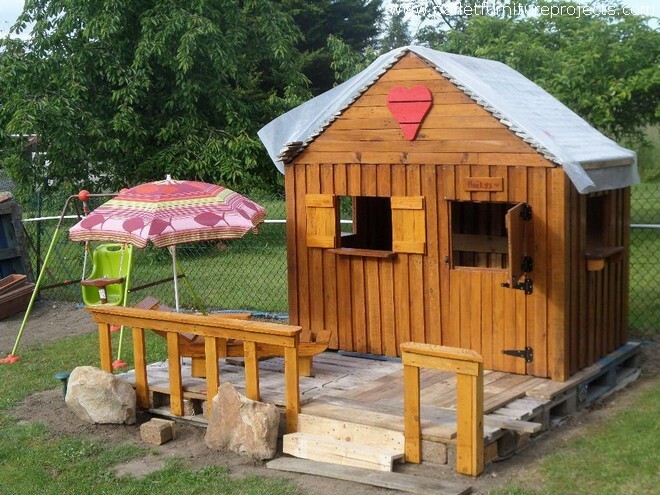 Make the best use of shipping pallets that are just lying idle in your backyard so far. 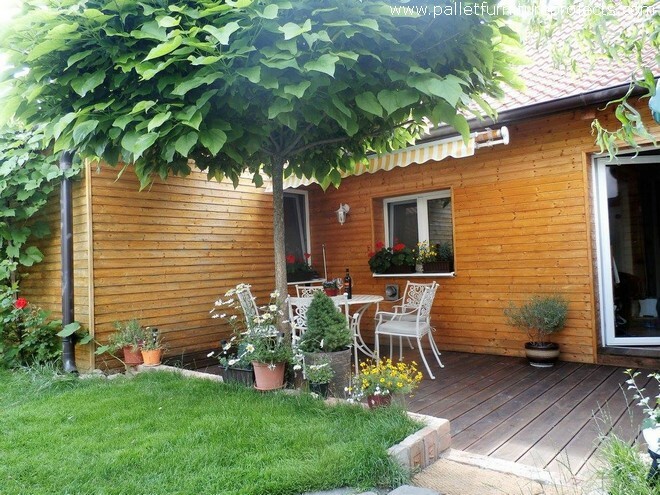 To make your patio more elegant and well designed, the best thing that you can do with the wood pallet is wall cladding. For this you need some larger amounts of shipping pallets at your disposal. Cut them in a sequence to maintain a symmetry and paste them along the wall individually. 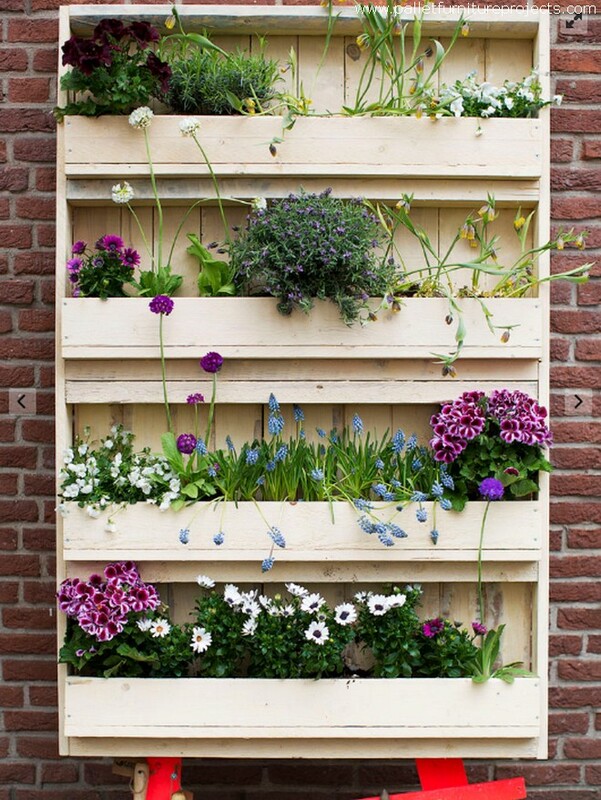 I am starting the article with this tremendous wood pallet recycled vertical garden. This is not mere a decoration piece but we have tried our best to turn it into a perfectly practical vertical garden where you can plant all your favorite annuals and some herbs as well. 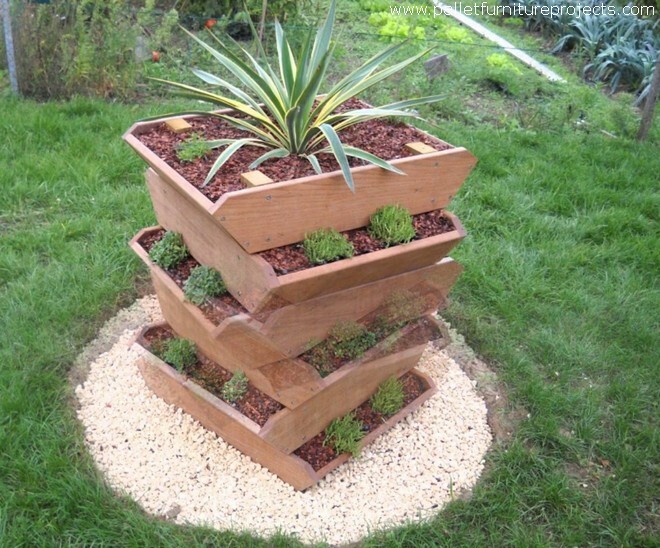 And this pyramid inspired wood pallet repurposed wooden planter is a tall beauty in your patio. This is a contradiction of all stereotypes. This tells you that you are not supposed to follow all the old fashioned planter ideas being a smart pallet wood crafter and make something worth noticing. We didn’t end up with the last pallet wood planter, here are a couple of more of wood pallet planters that would just make your c0ollection praise worthy. Some of the finest shipping wood pallets are put to task here. They are free from scars and any kind of contamination. 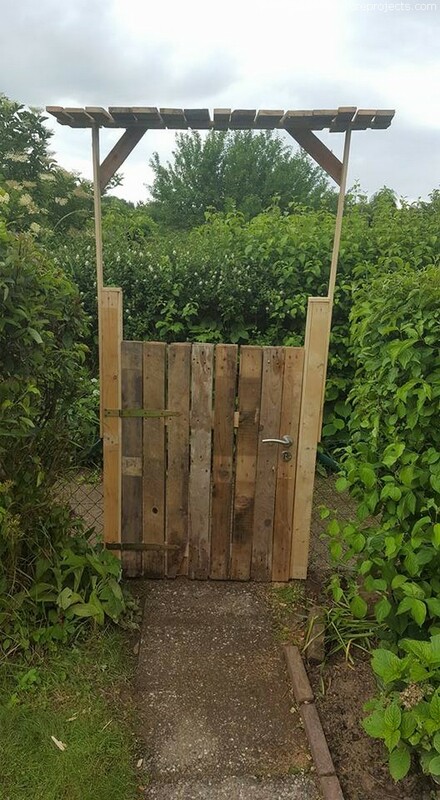 This wooden pallet garden gate is also a divider that proportionate the passage way and the green land. This is made is such a rough way that this can also be considered as a wood pallet garden décor idea. The wooden gate with a wooden shade on the top is different from conventional wooden doors. 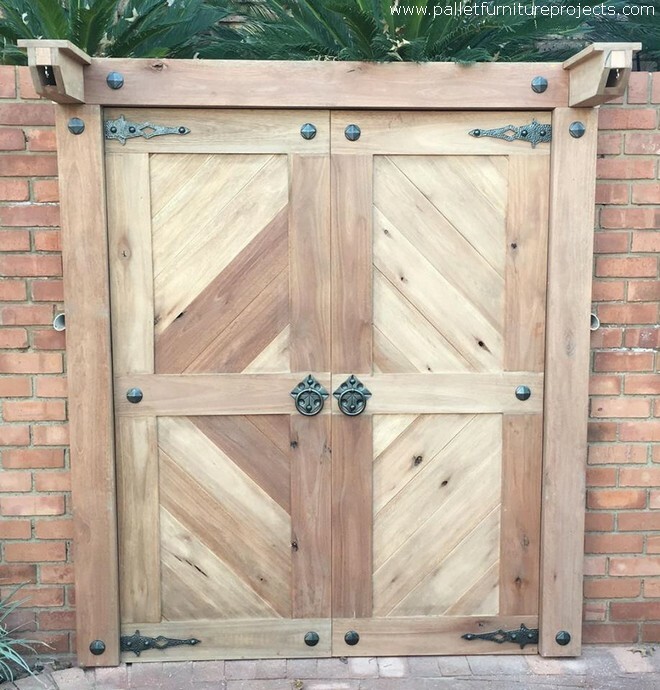 This elegant wood pallet door is another garden décor idea that would turn your green landscape in a royal looking garden with this splendid wooden gate installed right in the middle. Exquisite metallic knobs and railings all around add further in the beauty. And here comes a special wood pallet recycled multi purposed creation. 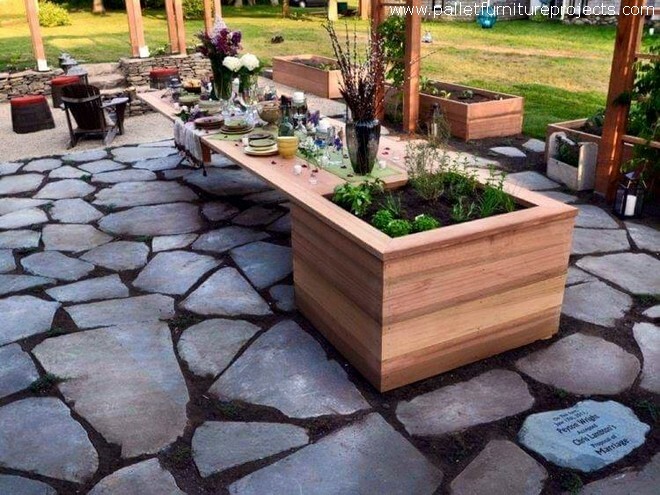 This large wooden installation can be used as a wooden pallet planter, and as an outdoor table as well. Use it for the dining or while having a party at your place. This will not let you down in any situation. 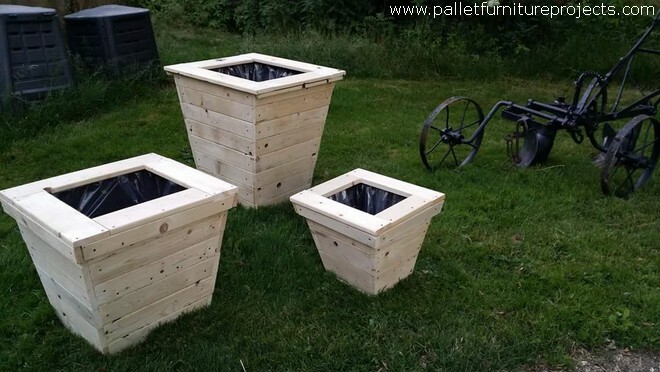 This is again a unique wood pallet planter that is quite different from the rest. 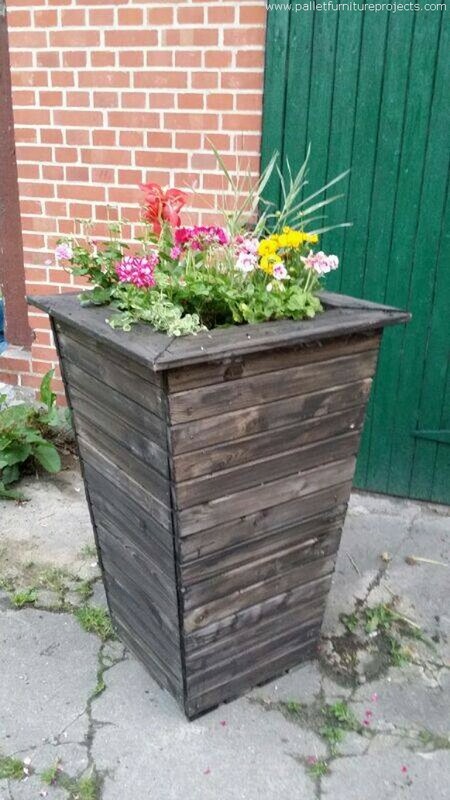 It seems like a number of pallet planters are twisted out of single unit. Basically each wooden tub is a separate wood pallet creation and they are put one on another.